WASHINGTON — In the wake of Tuesday night’s upset victory in upstate New York’s special election, the head of the Democratic Congressional Campaign Committee is expanding his horizons, pinpointing nearly 100 House seats that could present favorable match-ups for Democrats in 2012. He is also refocusing attention on unseating House Budget Committee Chairman Paul Ryan (R-Wis.). But the gravitational pull for Democrats to be “serious” and push for “responsible” cuts to the social safety net is inescapable. Check out the Big Dog, Bill Clinton, chatting up Paul Ryan behind the scenes of that Pete Peterson-funded fiscal summit today. 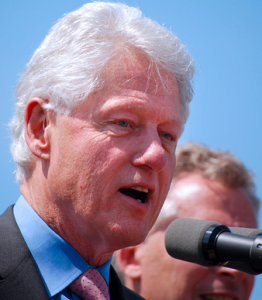 Bill Clinton was the ultimate DLC guy in office, and a lot of his economic team is sitting in the Obama White House. They don’t want an excuse to do nothing either, I’d suspect. Except doing nothing is the best hope of actually keeping safety net benefits at current levels. If you “do nothing,” the Bush tax cuts expire, tax rates go back to what they were under Bill Clinton when we created 23 million new jobs, and the medium-term deficit goes away completely. Doing nothing is a pretty darn good idea, at least compared to the alternatives. And lest we forget, there’s a jobs crisis and a demand shortfall happening in the country at the moment. This is actually good news because it indicates that the Republicans are so delusional that they will never agree to even the kind of fake tax hikes the corporate Dems are more than willing to give them in exchange for the cuts in “entitlements” so they think they need to sell themselves as “fiscally responsible.” As I’ve been harping for months — with the Republicans having gone completely over the cliff and the Democrats ready to compromise on anything in order that the Villagers finally acknowledge them as “grown-ups” the best thing that could happen is gridlock. Since it’s unlikely that the Democrats will ever draw a real line in the sand we have to depend upon Grover Norquist and Paul Ryan to stay crazy. Looks like that’s not going to be a problem.